Here is Max's story, just as he presented it to the ABA judges, some of the most accomplished people in the world of business. "I have lots of ideas. But, The Mug With A Hoop!TM is my best so far. In 2nd grade art class my teacher told us to make a mug. I like sports and hot chocolate so I put a hoop on my mug for tossing marshmallows into hot cocoa. I pitched my idea at Babson College and was named a top ten finalist in an innovation contest at Fenway Park. I ran a successful crowdfunding campaign, found a sourcing partner to allow large scale manufacturing overseas, and launched on the market in 2014. Now, with LOTS of help from my mom, dad and brother Sam, MAX’IS Creations has become a profitable family business! "In the last year, my team and I launched a multi-sport product line that now includes The Mug With A Glove! TM, The Mug With A Goalpost! TM, The Soccer Mug With A Goal! TM, and The Hockey Mug With A Net!TM We sold over 27,500 mugs in 2015 (that’s over $665,000 in retail sales across channels) bringing the total retail sales to over $1 Million since first launching on the market in June of 2014. Based on industry norms, that’s a LOT of mugs! 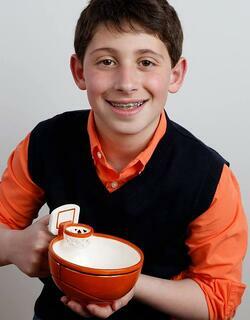 "My mugs created a whole new market. Adults like my mugs because they make them feel like kids again. And kids like my mugs because they’re fun. My mugs are sold at places like Nordstrom, The Grommet, Uncommongoods, Hammacher Schlemmer, and the Basketball Hall of Fame! The Mug With A Hoop! TM is currently a top selling mug on Amazon. "Lots of other great things happened in 2015. I got my first patent (at age 10) with additional design and utility patents pending. I signed my first licensing deal with Typo/Cotton On who quickly sold through the Basketball Mug! And I entered into a partnership with Boelter Brands, a major licensed drinkware company to bring MAX’IS Creations licensed mugs to market. An NCAA March Madness program is currently underway with NBA, MLB, MLS, NFL, NHL mugs coming next! "In the past year, me and my mugs have been featured in places like The Boston Globe, CNN Money and Gift Shop Magazine, with product placements on Real Simple, Woman’s Day and Buzzfeed. A Vat-19 video of my mug went viral with over 4 million views! Queen Latifah featured me on her show and my basketball and hockey mugs made separate appearances on The Today Show! "I happen to have dyslexia, a language-based learning disability often linked to creativity. Kids like me see the world differently and the world is lucky that we do! 1 in 5 kids in the U.S. struggles with learning and attention issues related to reading, writing, math, organization and attention. People with learning and attention issues can thrive when they get the support they need. That’s why I donate five percent of the profits from the sale of my mugs to dyslexia-related charities and nonprofits like Understood.org, which are dedicated to empowering parents of kids like me. "In the last year I shared the stage with people like Daymond John, John Legend and others to showcase the creative advantage of people with dyslexia. We recently updated my packaging to feature Understood.org as a public service announcement for this great resource. Since January 2015 I have donated thousands of dollars to dyslexia-related causes and over 1000 mugs to charity. Being honored by the Stevie Awards will help people see that kids like me are smart and can achieve success with the right supports. Imagine what other good ideas our world will have when ALL kids who think and learn differently are understood! Congratulations Max, we look forward to presenting your Gold Stevie Award to you on June 20 at The American Business Awards gala in New York.